Okay, that's it! I'm officially tired of winter! I need a Springtime Hello in the worst way! I feel guilty complaining since our BC winter has been particularly mild, unlike the rest of North America. But I am tired of grey and wet and mushy! I want sunshine and colours back! Who's with me? In a few days it will be Groundhog Day and then we'll get to see how much more winter we have to endure. Right! I always go with the opposite of what Punxsutawney Phil or Wiarton Willy indicate, or just resign myself to six more weeks of it. But my card making doesn't have to reflect the weather. So I took our next As You See It Challenge #021 to a Happy Place full of colour and flowers and buzzing bees! The Challenge is a very simple one this time around but balanced and beautiful, so it's not hard for our creations to look good! I went with some of the colours in the Sweet Sorbet DSP on the back panel: Basic Black, Crisp Cantaloupe and Summer Starfruit, with a little Pool Party thrown in. I used Crumb Cake rather than Sahara Sand for a little warmer look. The stamp set I used, as you may have gathered, is called Springtime Hello and it's found in the Occasions catalogue. I love the miniature flowers and bee! I inked up the flowers in Crisp Cantaloupe and the stems in Summer Starfruit using the Stampin' Write Markers. The bee was inked using markers as well, Summer Starfruit and Basic Black. Don't forget the heavy breathing on the stamp before you use it, to remoisten any ink that has dried while you were applying the rest. It really works. We call it "huffing" on the stamp. The frame for the main panel is created from the Peekaboo Frames Bigz L die. I just lined up the end of the horizontal cuts on my Stampin' Trimmer and cut where the score line would be to take out the middle "door". I replaced it with a slightly larger piece of Whisper White cardstock on which I stamped my image. The other stamp set used was Gorgeous Grunge (again) to create the spritzed look in Crumb Cake (stamped off once). The sentiment is stamped on a Crumb Cake flag and a Pool Party Candy Dot embellishes each end. Hope this little breath of spring helped to cheer you over the winter blues! 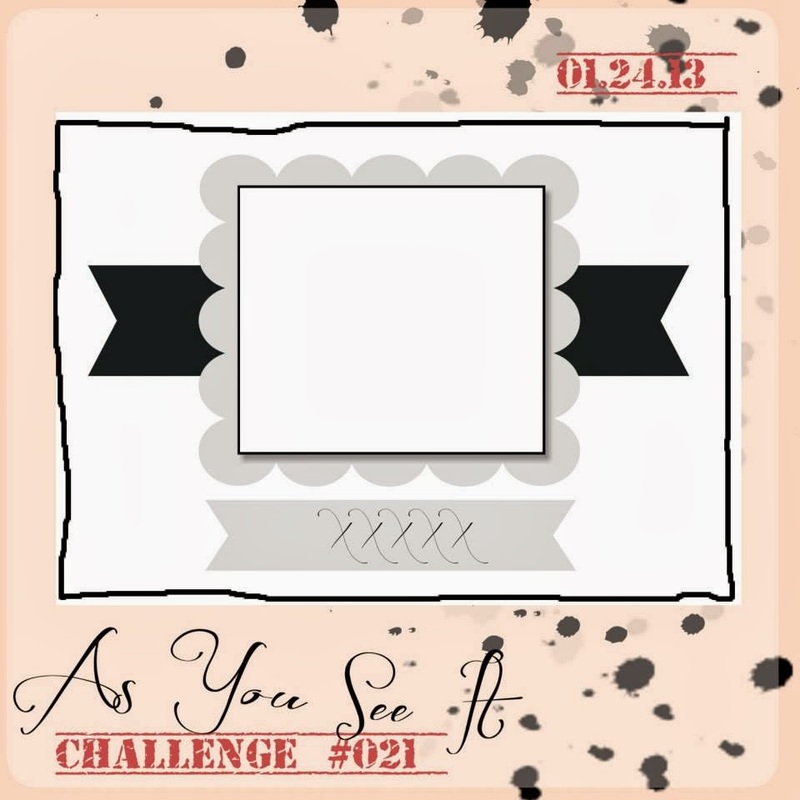 Why don't you take a little creative moment and play along with us at As You See It Challenges this week? *Available to earn with a $60 order during Stampin' Up! 's Sale-A-Bration starting Jan. 28, 2014. Oooh! I like this one a lot! What a cute bee! And I'm not with you on the spring thing- we haven't even had our winter yet! I must be becoming a true Northerner. So pretty and dainty and will be such a cheer for someone suffering with the "blues"
This is really pretty Heather! I always forget about that peekaboo frames die! Thanks, Kim! Do you do card challenges? You should try ours at http://www.asyouseeitchallenge.com/.